1Add water or stock, kombu, ginger, garlic cloves, onion and chicken into a large pot. Bring to a boil then lower heat and simmer covered for 30 minutes or until chicken is cooked through. 2Remove, onion, ginger and kombu and discard save the liquid and reserve the chicken for later use. 3Add the rice and bring to a boil, then lower the heat and simmer covered for 3 hours or until desired consistency. Occasionally stir the rice and check the consistency. While the rice is cooking shred the chicken. At the last 20 minutes of cooking add the mushrooms into the congee. 4When the congee is ready. Spoon the congee into a bowl and top with shredded chicken, green onion, a couple drops of sesame oil and soy sauce to taste. 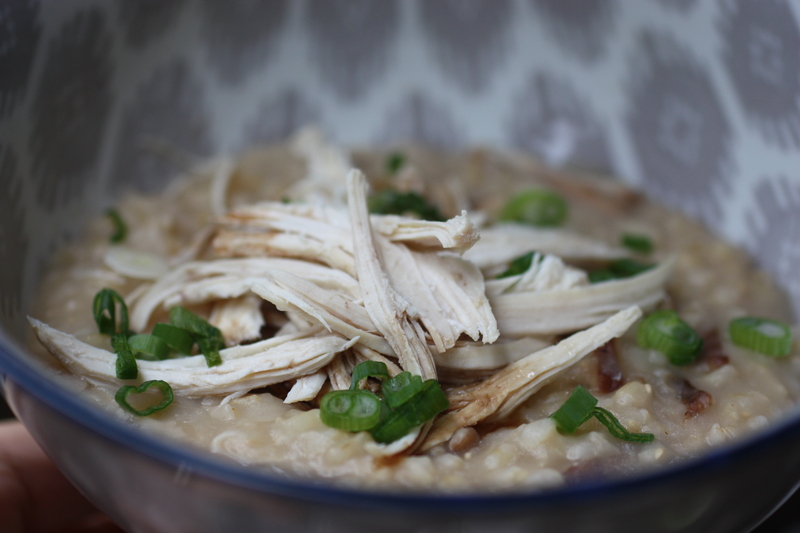 Leftover Tip: Breakfast congee. Take 2 cups of the congee bring it to a boil and whisk with a fork a single egg into it and serve.